“And he came out and went, according to his custom to the Mount of Olives, and the disciples also followed him….And he himself withdrew from them about a stone’s throw, and kneeling down he began to pray, saying, “Father, if thou art willing, remove this cup from me yet not my will but thine be done.” And there appeared to him an angel from heaven to strengthen him [perhaps like in the painting above]. And falling into an agony he prayed the more earnestly. And His sweat became as drops of blood running down upon the ground” (Lk 22:39, 41-44). Can you imagine what Jesus must have been going through in this scene to sweat blood? 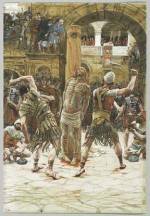 Soon afterwards, He would be beaten, and ridiculed in what would amount to a hasty show trial before the Sanhedrin. The members of that august Jewish judicial body, with the notable exception of Joseph of Arimethea, were clearly out for blood, our Lord’s! Early the next day Jesus would be brutally scourged by Roman soldiers who would then mock Him mercilessly by putting a purple cloak on Him and shoving a crown of thorns on His head in cruel “deference” to His majesty! In the throes of rage and envy the Sanhedrin, along with the chief priests, handed Him over to the Roman soldiers for crucifixion early the next day (Mt 27:18). Christ suffered a brutal humiliating journey through the streets of Jerusalem in what would be known as the Via Dolorosa, carrying a cross so heavy in such a weakened condition that he fell down three times, as we remember sadly when praying the Stations of the Cross. And when He finally arrived at Calvary, bloodied literally from head to toe, he was brutally crucified and died that afternoon so that each of us might have Eternal Life with Him one day in heaven! 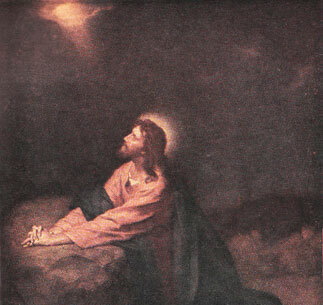 Many traditional renderings of our Lord praying to His Heavenly Father at Gethsemane show him in a rather stoic portrayal such as this one below. But those of you who have seen Mel Gibson’s classic film The Passion of the Christ may well remember that chilling opening scene where Jesus is indeed praying to His Father, but in a bloody sweat, like that described in Luke’s Gospel above. "He [Jesus] was trembling all over when he entered the grotto to pray…Alas! This small cavern appeared to contain the awful picture of all the sins which he been or were to be committed from the fall of Adam to the end of the world…He fell on his face, overwhelmed with unspeakable sorrow, and all the sins of the world displayed themselves before him, under countless forms and in all their real deformity. He took them all upon himself, and in his prayer offered his own adorable Person to the justice of his Heavenly Father, in payment for so awful a debt….I saw all the sins, wickedness, vices, and ingratitude of mankind torturing and crushing him to the earth." They built upon the sand wretched tenements, which they were continually pulling down and rebuilding, but in which there was neither altar nor sacrifice; they had weathercocks on their roofs, and their doctrines changed with the wind, consequently they were forever in opposition one with the other. They never could come to a mutual understanding, and were forever unsettled, often destroying their own dwellings and hurling the fragments against the Corner-Stone of the Church, which always remained unshaken." Indeed, as our Lord foresaw that night, the Catholic Church has often been scourged over the centuries both by enemies from within its ranks as well as from those without! Don’t forget it was an Augustinian monk, Martin Luther, who gave us the Reformation, and all the fragmentation of Christianity and misrepresentation of traditional Church teaching that followed. In another more recent example, Pope Paul VI lamented in 1972 that the smoke of Satan had entered the Vatican. And we’re still cleaning up various messes around the world from the priests’ scandals uncovered by the laity in the early 2000’s! And yet, our Lord predicted the gates of Hell would not prevail against His church (Mt 16:18). Amen! These quotes above from Anne Catherine Emmerich’s book provide just a taste of the alarming visions Jesus beheld. He also saw actual suffering he was to endure in His Passion starting in only a few hours’ time! No wonder He asked His Heavenly Father to let this cup pass 3 times (Ch. 26 in Matthew's Gospel). In addition, he was grievously distressed thinking about those many souls for whom His sacrifice at Calvary would be in vain! "He beheld all these men, sometimes separated from the True Vine, and taking their rest amid the wild fruit trees, sometimes like lost sheep, left to the mercy of the wolves, led by base hirelings into bad pasturages, and refusing to enter the fold of the Good Shepherd who gave his life for his sheep." Nevertheless, he said to His Father“yet not My will but thine be done” as quoted above. Jesus once told the French Mystic Gabrielle Bossis, as she recorded in her wonderful book He and I that God sees all time in a glance. Imagine what horrible scenes from the future He saw at the Mount of Olives that night! The army of the future saints passed before the soul of our Lord, which was thus placed between the desiring patriarchs, and the triumphant band of the future blessed, and these two armies joining together, and completing one another, so to speak, surrounded the loving Heart of our Saviour as with a crown of victory. 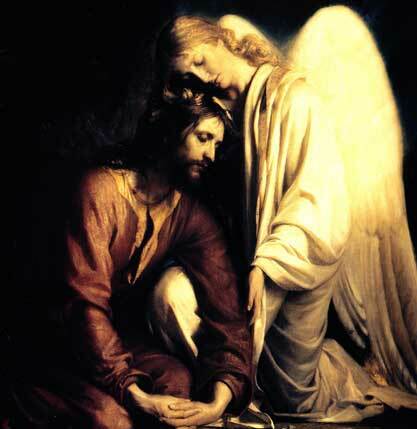 This most affecting and consoling spectacle bestowed a degree of strength and comfort upon the soul of Jesus. Ah! He so loved his brethren and creatures that, to accomplish the redemption of one single soul, he would have accepted with joy all the sufferings to which he was now devoting himself. As these visions referred to the future, they were diffused to a certain height in the air." When meditating on the Agony in the Garden, which is the First Sorrowful Mystery of the Rosary, I’ve often felt inspired to try harder to live in such a manner as to be one of those people our Lord saw that night who gave him courage and strength to go forth into the vipers’ nest of those screaming for His crucifixion. We are all called to give glory to God in our lives, even in the everyday things we do that can nonetheless show Him our love! 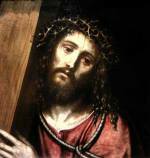 As this Lent draws to a close and we meditate in a very special way on our Lord’s Passion on Good Friday, let us all try to be among those people whose lives of love and obedience to His commandments gave our Lord consolation and renewed vigor in the midst of all those bleak and bloody images from the future. I pray that Jesus can somehow have seen each of one of us in that consoling vision, thinking “at least my suffering will not be in vain for them. They’ll honor My sacrifice with their love.” And may we all thus be able to join Him in paradise one day!